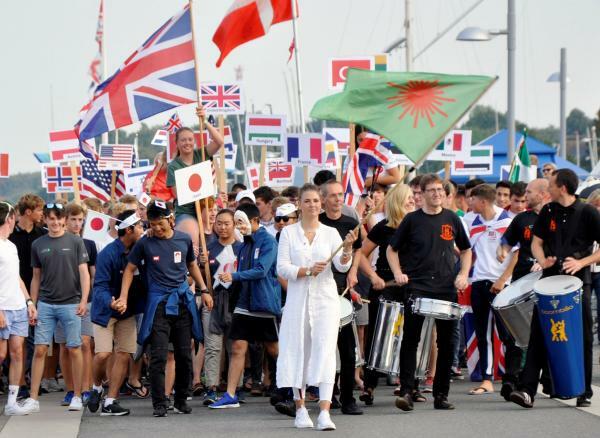 (Kiel, Germany) The Laser Radial Youth World Championships is the fourth biggest sailing event for the Laser class in Kiel-Schilksee within a few years. This week, over 370 active sailors from 44 nations will be fighting for the World Championship titles. There will be two titles awarded to both the girls and the boys: under 19 years old and under 17 years old. The babble of voices in different languages could be heard across the marina in Kiel-Schilksee. Colorful flags waving were accompanied by samba rhythms. The Olympic marina is once again in international hands for the opening ceremony of the Laser Radial Youth World Championships. “You are the future of our sport,” said Eric Faust, representative of the International Laser Class Association. He said he is happy that Kiel is hosting the World Championships. Carsten Krage, Chairman of the Kiel Yacht Club, wished the athletes much success in the races and many friends ashore. “It is a pleasure for us and an honor to have you here.” The Lord Mayor Ulf Kaempfer was also happy to see sailors from all around the world. “It is fantastic to welcome that many talented, young sailors in Kiel.” Sunshine and warm water are not always usual for Kiel, but he was hoping that the endless summer this year will also last this week. “Now we can start,” said Laura Schewe. She is motivated and has found an efficient way to fight the slight nervousness. “At a regatta on the home territory the expectations from outside are higher. And before a World Championship there is a bit more tension that you have to control.” She can free her mind by spending time with friends, for example. However, it is good to have the regatta in front of the door. “It is the carefree package ashore. You know for example that the fridge is always full,” she said smiling. Until Friday, she had trained before enjoying a break of two days, where everything could be processed. “So I can be fully motivated and am really up to sailing the regatta.” Her goal is a place in the top five. “I want to confirm the result from last year.” The fleet is strong. Emma Savelon from the Netherlands is at the start line. She was ranked fourth last year just in front of Laura Schewe from Altenholz. And in Corpus Christi at the Youth Worlds of the World Sailing Association, Savelon even came in second.